Strengthen your heart chakra with this hand fabricated belly button ring! This particular ring resembles a little person, delicately crafted of sterling silver, whose pink jeweled heart is open wide and shines brightly! Open your heart and show off your stomach with this unique piece! 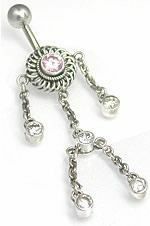 Check out matching Split Bali Earrings to go with this lovely sterling silver belly ring.